The Binder Minder consists of 4 parts. Two wooden ends, a wooden rod and a plastic roller. The entire unit is about 8" long, 4" high and 4" wide. It easily will hold all of the binding for a king-sized quilt. The two wooden ends hold the rod of the Binder Minder and prevent the unit from rolling when the binding is pulled. They have captured nuts in their centers to hold the wooden rod. Your choices for wood include Red Oak, Black Walnut and Pennsylvania Black Cherry. The wooden rod has screws at each end that attach to the captured nuts in the two wooden ends. It is about 6 inches long allowing for a large amount of binding to be rolled on it. 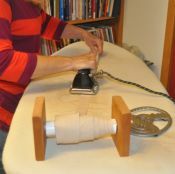 The fourth part is the plastic roller that fits over the wooden rod and holds your binding. It has two slits in one end that allow you to start winding the binding without it slipping. 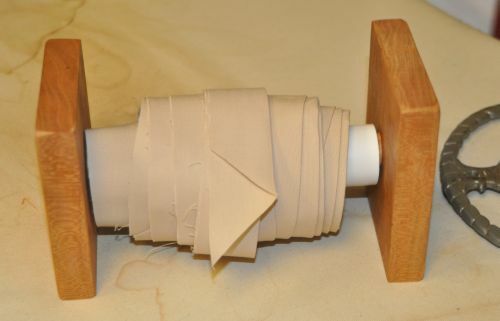 It easily rolls on the wooden rod allowing you both to attach the binding and to pull it off when you sew. You can purchase extra plastic rollers at a nominal cost to store binding. 1.) Cut out your binding and sew it into a long ribbon as you normally do. Press it with a hot iron while you roll it onto the Binder Minder. 2.) Remove the plastic roller from the Binder Minder and attach one end of the binding to the unit. 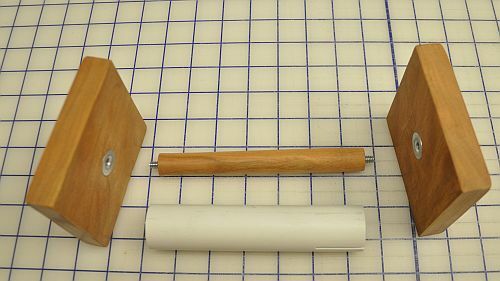 Insert the wooden rod into the plastic roller. You may need to hold the binding in place with your fingertip in order to do this. 3.) Place the Binder Minder at the large end of the ironing board. 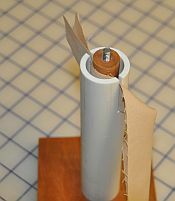 Fold and iron your binding and then roll that section onto the Binder Minder. . 4.) Once you have your binding rolled on the Binder Minder, place the unit in proximity to the needle on your sewing machine. If the throat of your machine is large enough, place the Binder Minder in the throat space, otherwise, place it as close as convenient to the needle of your machine.